Spring is just around the corner. If you’re getting ready to put your house on the market, that means it’s time to add a little pizzazz to the exterior. First impressions count in real estate, and making your home look inviting on the outside will coax more buyers through your front door. Since spring is one of best times to make your home look stunning, we thought we’d share our tips on how to spruce up your curb appeal without emptying your wallet. And the bonus is that these projects will only take a weekend to complete. Your yard probably took a beating over the winter. With the weather warming up you have no excuse to skip what is arguably the most important part of curb appeal – a tidy yard. The best part – you can do this without spending a dime. Mow the lawn if needed and collect any fallen leaves and debris. Trim trees and bushes and weed flowerbeds. Another easy and inexpensive idea to brighten up your home’s exterior is to give your front door a fresh coat of paint. For about $30 and one afternoon, your front porch can go from bland to beautiful. Choose a bold color that complements the exterior colors to create a strong focal point that will draw the eye (and the buyers) in. When was the last time you got new numbers for your house? If you can’t think back that far, then now is a great time to invest in some new ones – especially if their style is a little dated. 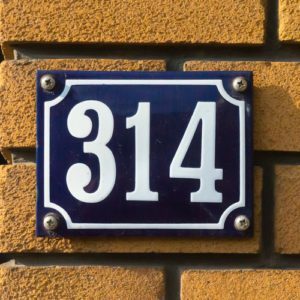 You can purchase single numbers at home improvement stores for as little as a few dollars each, or splurge and buy a custom-designed plaque that matches the exterior of your home for under $100. If your mailbox is cracked, broken or faded from being in the sun, why not replace it with a new model? This is another great way to add some personality to your front yard without spending too much money. Choose a mailbox that coordinates with your front door and your home’s exterior. Check out these mailboxes, some of which can be purchased for less than $20. A porch light that’s been hanging around for a few decades can really date your home. For as little as $30 you can switch out your old and dirty light for something new, clean and more modern. Again, choose a style that matches your home’s exterior, especially if you’re also replacing your mailbox and house numbers. Want to add an instant pop of color to your front yard that doesn’t require much work or money? Then you want annuals. Annual flowers like petunias and impatiens only last for one season and are planted when they are already in bloom. For under $100, you can pop some into your garden beds or add some decorative pots to your front porch filled with flowers for a cheerful boost that practically begs people to stop and admire them.